Are personalised backplates enough to make this low-cost Android smartphone stand out? The Vodafone Smart might be a budget offering, but for £70 you're not going to find a lot to love, even if this is your first smartphone experience. Vodafone's Smart is one of the most affordable Android devices on the market. Certainly, at £70 on pay as you go, it is attractively priced. But does it live up to what Android can offer? A low price and good value for money aren't the same thing. For all those of you who were expecting us to make the comparison at some point let's get it out of the way. The obvious comparison is with the Orange San Francisco. We simply loved that £99 Android smartphone. Other low-cost Android options include something like the Motorola Flipout though if you can stretch the budget you could go for something like the HTC Wildfire, currently around £129 SIM-free. So, the Vodafone Smart enters crowded territory. Vodafone has tried to differentiate things by letting you create custom backplates for £10 each. We got our own TechRadar one, obviously, and it looks pretty special. You can choose from a range of background colours and patterns, use your own photos or choose text, symbols etc from the web to get a really personalised look. You can have a play on the Vodafone Design Studio web page. Unfortunately for Vodafone, bespoke backplates aside, the Smart looks every inch a budget handset and behaves like one, too. Our review sample had a white chassis, although black is also available. It feels quite plasticky, and our custom backplate didn't quite fit flush all the way round which was very disappointing. The Vodafone Smart is light, though, at just 104g, and small at 103.8 x 56.8 x 12.6mm. It's the kind of handset that will suit small, childlike hands, although the build quality is something we can get on board with as it's sturdy plastic and good enough for the price. However, this necessarily means the screen is small, and at just 2.8 inches you might think it's undercooked for Android. Features-wise, you've got the smartphone basics packed in, with HSDPA, Wi-Fi, Bluetooth, GPS all here. The camera is limited at just 2 megapixels, and onboard memory is tight at just 130MB. A provided 2GB microSD card immediately gets you over that problem, but rather stupidly it's located under the battery, making hot swapping a total pain in the proverbials. There's a headset slot and the power button on the top, microUSB connector on the bottom and a volume rocker on the right - and that's it, as far as buttons and connectors are concerned. 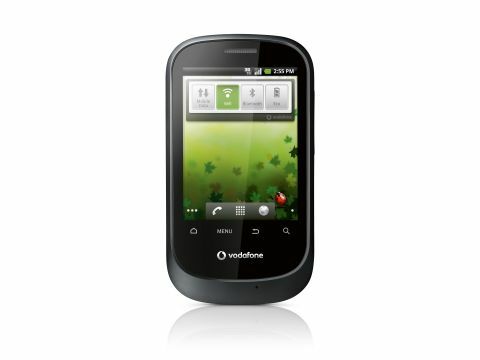 So, you can already see that compromises have been made to get the Vodafone Smart to its low, low price point. We need to find out how much the compromises affect our enjoyment.